Cherimoya (botanical name Annona cheirimola), also known as chirimoya, is native to southern Ecuador and northern Peru. The fruit is dominant in tropical countries hence it is unheard of by many Americans. Nowadays, it is also grown in South Asia, South and Central America, California, Hawaii and northern Africa. You can recognize a cherimoya by its irregularly oval shape. It has green skin and has creamy white and sweet flesh with large, black seeds. Because of its sweet and creamy flesh, this fruit is also called custard or sugar apple. Cherimoyas are high in fiber, cholesterol-free and an excellent source of iron, niacin and potent cytotoxins. It also has high contents of potassium, copper, magnesium and a good source of a few B vitamins. Cherimoya contains several polyphenolic antioxidants that are powerful to protect against cancer. Anti-cancer: Acetogenin that is found in the leaves and stems of the cherimoya plant is used in cancer treatment by starving cancer cells. 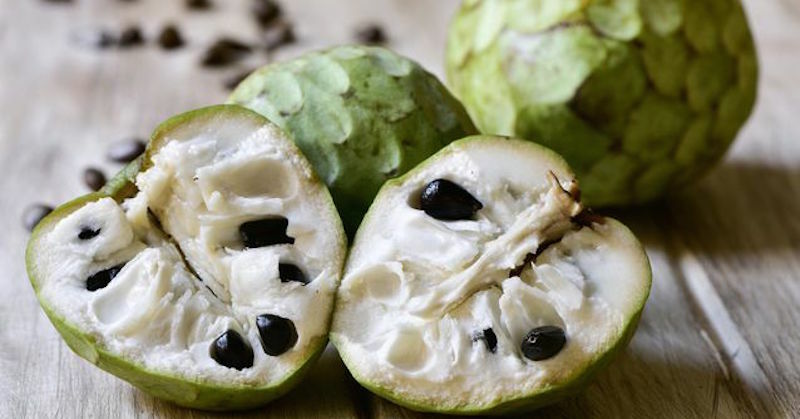 Combined with its powerful antioxidants called asimcin and bullatacin, cherimoyas have potent anti-cancer properties which make it a good fruit for people with cancer. Constipation: Cherimoya is an excellent source of fiber that is important consumption for maintaining the health of the digestive tract. It helps to relieve constipation by adding bulk to stool. Hair growth: Thinning and greying hair? No problem! Cherimoyas have vitamin C, iron, magnesium and zinc that help enhance and stimulate healthy hair growth. Hair lice, rid: Dried cherimoya seeds can be ground into powder, add water and make into a paste. Apply this paste to the scalp, leave for 30 minutes then wash off. This procedure can help to get rid of hair lice. Heart health: Vitamin C in cherimoya fights free radicals to destroy lipids, improve blood flow and heart health. It also has balanced sodium and potassium ratio that are right for blood pressure and heart rate. Immune system: Better immune system is another one of wonderful health benefits of cherimoya fruit. The high Vitamin C content of cherimoya will also give your immune system a boost and help to protect against colds, flu and other viral infections. Skin health: Problems with wrinkles, fine lines and blemishes? Cherimoya provides high antioxidants that are anti-aging agents which are essential in keeping your skin healthy. The vitamin C content is also necessary for development of collagen that supports skin elasticity. Cherimoyas are usually eaten by scooping out the flesh, leaving the seeds out. It can also be added into smoothies for a rich beverage, or made a fruit cocktail and milkshakes. Due to its high fructose content, it may be best that diabetics avoid eating too many of them.